Malignant mesothelioma is an uncommon, asbestos-related tumour which affects the protective tissues covering the lungs, midriff and heart. Multimodal treatment incorporates medications to kill cancer cells in different ways. Doctors advise choosing this method as this is considered the best treatment for mesothelioma. Patients who are diagnosed with this condition are suitable for a blend of surgery, chemotherapy and radiation treatment. 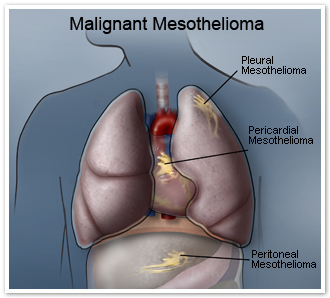 Malignant mesothelioma is considered an occupational cancer. The leading cause of the occurrence of mesothelioma is accepted to be asbestos. Those who work in shipping, construction, and similar industries are at huge risk. Mesothelioma grows gradually after exposure to asbestos. It is a slow growing cancer, the symptoms of which may remain dormant from 10 to 60 years. When asbestos is broken or powdered, it discharges filaments or residue into the air. People inhale them unknowingly. The filaments are little and can reach the farthest regions of your lungs and stay there. The body's defence mechanism kicks in, and attempts are made to remove them in the form of coughing and vomiting, which fail. As a result, it causes swelling in the adjacent lung tissue. The small filaments can move into the lungs and into the pleura, where they can remain and gradually develop into pleural mesothelioma. People who are exposed to asbestos on a regular basis are more likely to have a definite diagnosis of mesothelioma. Asbestos residue or strands noticeable all around cause more damage than any other factor. What are the Signs and Symptoms of Malignant Mesothelioma? Although some symptoms are common, it is advised to not to overlook them if them start occuring frequently. What Diagnostic Procedures are Available for Malignant Mesothelioma? Computerised Tomography (CT) Scan This test provides the doctor with clear, cross-sectional images of body’s internal structures and muscles. The size and shape of a tumour can be detected through this method. The doctor injects the patient with a dye and slides the movable table inside a doughnut-shaped machine. Magnetic Resonance Imaging (MRI) An MRI is an imaging test that may be used to diagnose any unusual tissue or growth. It helps in determining the size and location of a tumour. The doctor makes the patient lie on a table, who is then slid into a tunnel-like machine, where magnetic field radio wave pulses scan the patient’s body and create the images. Whether to inject a dye or not is the doctor’s decision. Positron Emission Tomography (PET) PET uses a small amount of radioactive materials called radiotracers, a unique camera and a PC to help assess your organ and tissue functions. By studying body changes at the cell level, PET may identify the early onset of a disease before it is evident on other imaging tests. Biopsy: A biopsy is the scraping of tissue for examination under a microscope. If the specialist speculates that the mesothelioma has spread, a biopsy might be done to discover where the disease started, which can enable the specialist to decide the course of treatment. A thin, empty needle is utilised to gather the tissue. This is known as a fine-needle biopsy or fine-needle goal. The biopsy is performed by a radiologist who uses particular imaging techniques, for example, CT scans, to manage the needle straightforwardly into the tumour. A pathologist dissects the sample(s) evacuated amid the biopsy. X-ray A radiologist can tell if a tumour is harmful by the manner in which it shows up on the x-ray. A chest x-ray is often performed to check whether disease has spread to other parts of the body. Complete Blood Count The complete blood count, or CBC, typically includes the following: White blood cell count (WBC or leukocyte count), WBC differential count, red blood cell count (RBC or erythrocyte count), haematocrit (Hct), haemoglobin (Hgb), mean corpuscular volume (MCV), mean corpuscular hemoglobin (MCH), mean corpuscular hemoglobin concentration (MCHC), red cell distribution width (RDW), platelet count, and mean platelet volume (MPV). The most well-known treatment for mesothelioma includes a combination of surgical intervention, chemotherapy and radiation treatment. Strong medications can help calm side effects as well. Chemotherapy Chemotherapy is the use of highly concentrated medications to obliterate cancer cells. It works by destroying the cells' ability to multiply. Radiation Therapy Radiation treatment is the utilisation of high-energy x-rays or other particles to destroy tumour cells. A radiation treatment calendar comprises a particular number of radiation therapies given over a set timeframe. Pneumonectomy In this procedure, a whole lung is removed. This is done so that the mesothelioma doesn’t spread to other parts of the body. Potentially Curative Surgery This procedure might be an alternative considering that the patient's overall health is good and cancer hasn't spread to other parts of the body. Tragically, even when the specialist removes the majority of the cancer cells, recurrence may still happen. Palliative Care Palliative care incorporates constant attention overseen by a care group to provide relief from side effects, pain, and stress. It's intended to enhance personal satisfaction for patients and their families. Malignant mesothelioma is mostly uncurable and has an extended dormancy period, which implies it stays undetected until the point when the disease has reached an advanced stage. There is no solution for mesothelioma; however, the scientific research has been gradually making progress in searching for its treatment.